Cystic fibrosis (CF) is a genetic disorder in which chronic accumulations of thick mucus, called sputum, can trap bacteria in the lungs and cause frequent, serious lung infections. There is no cure for cystic fibrosis, but infections can be treated with antibiotics. Now, Caltech researchers have developed a technique to render sputum transparent in order to visualize bacterial infections in action. The technique, called MiPACT, allows researchers to tag bacteria and other cells with different colors, creating a three-dimensional "biogeographical map" of infections in sputum samples from CF patients. With this map, the researchers discovered that the majority of bacterial pathogens are in a slow-growth state—and thus physiologically resistant to most antibiotics, which have been developed to treat bacteria in a fast-growing state. 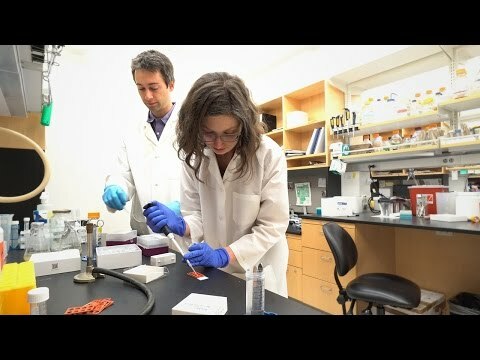 MiPACT—or Microbial identification after Passive CLARITY Technique—was developed in the laboratories of Dianne Newman, Gordon M. Binder/Amgen Professor of Biology and Geobiology and HHMI Investigator, and Viviana Gradinaru (BS '05), assistant professor of biology and biological engineering and a Heritage Principal Investigator. A paper describing the technique and the results appears in the September 27 issue of the journal mBio. "The ability to see pathogens in sputum allows us to now observe a real disease environment— we can see things like white blood cells engulfing bacteria, and where bacteria form aggregates called biofilms," says Will DePas, cofirst author on the paper and a postdoctoral scholar in the Newman lab. "For example, with MiPACT we can see Streptococcus—a bacterium commonly found in cystic fibrosis lung infections—and we have observed that streptococcus aggregates tend to form around a specific type of host cell in a previously unknown host–bacteria interaction. This kind of interplay can greatly influence the progression and clearance of an infection, with bacteria and host cells each trying to gain the upper hand." "Previously, if we wanted to analyze bacteria in a sample of sputum, we would have to homogenize the sample and then extract RNA or DNA," says cofirst author Ruth Starwalt-Lee, a research technician in the Newman lab. "This will tell you which bacteria are present, how many there are, and what genes are being expressed, but it doesn't provide any spatial information about the infection environment, such as the nature and arrangement of bacteria-bacteria or bacteria-host interactions." In 2014, the Gradinaru lab developed a technique called PACT or Passive CLARITY, to render organs and firm tissues transparent. Newman, whose own lab studies microbial survival strategies in the context of infections, recalls reading about Gradinaru's work and being struck with a moment of clarity herself. "It hit me that maybe this could be applied to the things we work on in my lab—namely, cystic fibrosis sputum," says Newman. "We had been studying an important CF pathogen in my lab for many years, but found ourselves increasingly motivated to determine whether our laboratory findings were relevant in actual infections. We literally needed a new way of seeing." Biological samples of medical interest such as tissues, organs, phlegm, and bones are all opaque because they contain molecules—specifically, lipids—that scatter light. The previous PACT method from the Gradinaru lab could remove these molecules to render the tissues transparent. However, the process of removing lipids causes an amorphous substance like sputum to dissolve, as the components of sputum do not have an ordered, bound structure like cells in tissue. The team needed to develop a variant of the method that could remove lipids while still keeping the sputum intact and even confer some rigidity for ease of handling during experimentation. "PACT was developed for tissues that already have some 3D structure and consistency, such as the brain or heart," Gradinaru says. "Sputum is challenging because it does not have this structure. With MiPACT, we employed a thick hydrogel that we can infuse into a sample of sputum, locking bacteria, cells, and other components in place for subsequent detection." The lipids can then be removed without disturbing the position of these components, and the sample is completely transparent. As a last step, probes that can glow in different colors and bind to specific ribosomal RNA sequences are diffused into the sample, allowing for the visualization of various bacterial cells. "Cystic fibrosis research is often focused on Pseudomonas aeruginosa—which is the dominant pathogen in the lung near the end of a patient's lifespan," Newman says. "However, there are many important pathogens in the early stages of the disease—for example, children with cystic fibrosis are more likely to have Staphylococcus aureus. Each of these pathogens have distinct aggregation patterns. It's important to determine how these different bacteria behave in order to design experiments that come as close as possible to capturing the actual conditions of chronic infection." MiPACT is amenable to large volumes, so researchers looking at sputum can study a truly representative sample of the environment in the lungs. Additionally, the technique is not unique to imaging cystic fibrosis sputum and has applications for the study of microbial communities in diverse environments, including the human gut. "We hope that MiPACT will enable the study of microbe-host interactions in diverse contexts," said Newman. "One meaningful area of potential application would be to better understand the structure and function of beneficial microbial communities, such as those comprising the human microbiome." "The National Microbiome Initiative, launched earlier this year by the White House Office of Science and Technology Policy, specifically called for new methodologies to study microbial communities across diverse environments," adds Gradinaru. "The MiPACT technology is extremely versatile and can be applied to many topics in parasitology and microbiology: wound infection, biofilm formation, microbe distribution within a niche, or host-microbiome interactions such as in the human gut." The paper is titled "Exposing the 3D biogeography and metabolic states of pathogens in cystic fibrosis sputum via hydrogel embedding, clearing, and rRNA labeling." Other Caltech coauthors are Lindsey Van Sambeek, currently a resident in the Ohio State University's Department of Emergency Medicine; and Sripriya Ravindra Kumar, a graduate student in the Gradinaru lab. Funding for the work came from the National Institutes of Health; the Howard Hughes Medical Institute; the Center for Environmental Microbial Interactions; the Heritage Medical Research Institute; and the Beckman Institute for the Resource Center on CLARITY, Optogenetics, and Vector Engineering. MiPACT-HCR, a tissue clearing technique designed for bacterial retention and identification, was applied to a sputum sample from a cystic fibrosis patient. Confocal microscopy of cleared sputum revealed that Streptococcus (green) aggregated around host cells stained with WGA lectin (orange). DAPI staining (blue) shows host cell nuclei. Following the MiPACT protocol, fixed and embedded sputum samples are cleared in SDS detergent and incubated in refractive index matching solution (RIMS) for visualization. WGA lectin staining for mucin (orange) and DAPI staining for DNA (blue) revealed that sputum samples from different patients vary in their composition.